Moving to a new PC is quite a challenge as Windows 10 has no tools to accomplish this task. For many users, getting their data files such as photos, videos, music, email, contacts, spreadsheets, documents, etc. to their new PC is a major concern and may even result in the delay of purchasing a new PC. 1. Upload files from the old PC to cloud storage (Google Drive, OneDrive, Dropbox, etc.) Now the user can easily access these files from anywhere and download the files to their new PC. But if the user has a lot of data, the upload will take a very long time – and, their data might exceed available storage. 2. Transfer using a USB stick or external hard drive. 3. Transfer across a network user Explorer by sharing the old hard drive to the new PC. 4. Use a file transfer utility. The key problem to all of the above options is that the user must know what they desire to transfer, must know where the data is located on the old PC, and must manage the process. The secondary problem is that there’s a good chance the user really wants more than just data files which they might not realize. A typical user will miss quite a bit of data – perhaps they leave behind their Outlook data, files they accidentally saved in an unusual location, data related to a specific application that was saved in the application’s folder (such as tax files), Internet favorites, shortcuts, and much more. Laplink offers a better option. PCmover Professional is the only software that can selectively move programs, files and settings from an old Windows PC to a new PC. It’s fast, easy, and powerful. Simply install PCmover on both of the computers and follow the simple wizard to transfer everything desired to the new PC. Users don’t need to know where the location of their files; PCmover knows and will find and transfer all files a user wants regardless of where they were saved. PCmover transfers more than just data files. It also automatically transfers all selected programs and settings. And programs are transferred ready to use on the new PC so a user doesn’t need to reinstall them or find old CDs or license keys. PCmover transfers using any home or business network (wired or wireless) or using a direct-connect (Laplink High Speed Transfer Cable. Once a user completes the short wizard, they walk away and PCmover does the rest. Laplink also provides free 24/7 transfer assistance from certified PC migration experts who will guide the user through the transfer over the phone or by remote control. Laplink also offers PCmover Enterprise which leverages the PCmover technology to allows IT departments to easily set up and manage controlled PC deployment projects for one thousand to hundreds of thousands of PCs. Organizations using PCmover Enterprise typically save over $300 per PC deployed by reducing deployment labor, post-migration support and help desk calls, as well as user down time – and end user satisfaction is higher. If a user is certain they only want to copy data files, Laplink Sync is an easy and powerful solution that will transfer files between PCs, Macs, Android and iOS devices utilizing a 3-step wizard. Files are transferred directly between devices to protect privacy (i.e., no copies exist in cloud storage). Laplink Sync can be used to transfer files or to keep files synchronized between devices. Making history, Microsoft released its first hardware device worthy of competing in the marketplace. 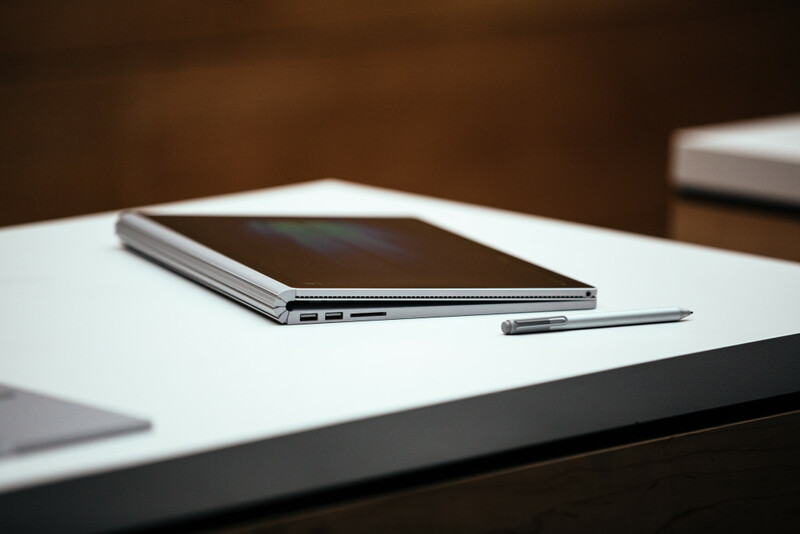 The Surface Book is a 13.5-inch laptop with “a killer display, maxed-out guts, a funky cool hinge, and a display that detaches to become a thick, powerful tablet” (source.) It’s also $1,500, which is on par with Apple’s Macbook laptop series. New and exciting laptops and convertibles (laptop/tablet) are announced everyday from major hardware manufacturers like HP, Dell, Toshiba or Lenovo. But with Microsoft’s announcement of their new hardware devices on October 6th, even critics were cheering. 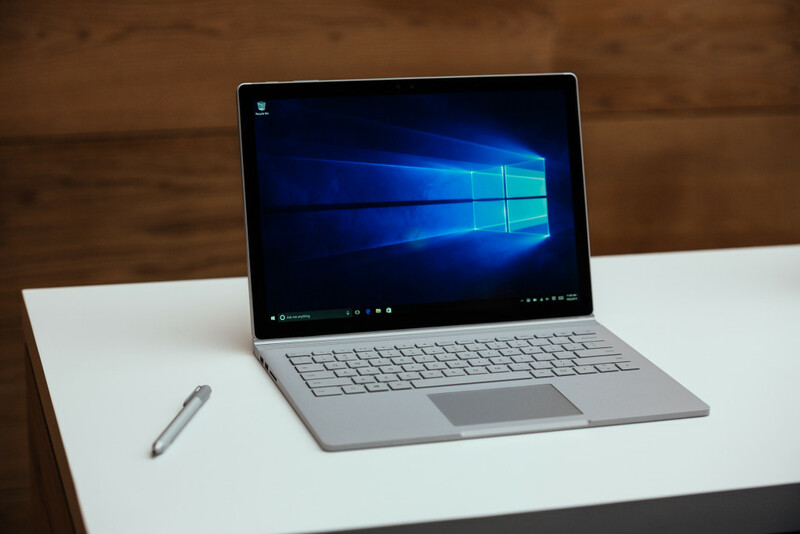 With the new Windows 10 available on these new devices, it is officially the time to retire your old hardware; there has never been a better time to buy a new device. Whatever you buy, remember that Laplink’s PCmover will save your day by making a migration of your old Windows PC’s documents, folders, pictures, music, videos, user profiles, thousands of settings, and programs (applications) easy to move. PCmover automates a tedious, manual process, making it painless. It’s time to buy a new PC, and when you do,be sure to buy PCmover Professional with it! Many organizations underestimate the time end users spend to become familiarized with their new PC system, as well as problems with migrating existing user data, and settings recovery. This time can easily exceed three to four hours. These soft costs are often not part of IT budgets, but are of great concern for business owners experiencing employee-productivity drops. End user customizations are frequently not considered in the overall plan. Customization are mostly left for the employee to complete on company time. Customizations like reapplying and creating settings for the new desktop can be beyond a normal users’ comprehension, leading to a surge in PC helpdesk requests with associated cost of $50 or more per call. The third mistake is underestimating the logistics associated with PC migrations for users in remote locations and international subsidiaries, which can prove to be extremely difficult. The need to outsource to a contractor or flying a staff member to a site, causes deployment issues and costs to rise quickly. The fourth, and final, mistake occurs inadvertently when data and settings are left behind. In a recent study conducted with enterprise level IT departments, the results were troubling: 27% of respondents who used various tools for transferring data and settings reported data loss in the process. With new PC deployments on the forefront of many IT teams tasks, issues surrounding the fact that there are few tools at the enterprise level to successfully complete this endeavor. 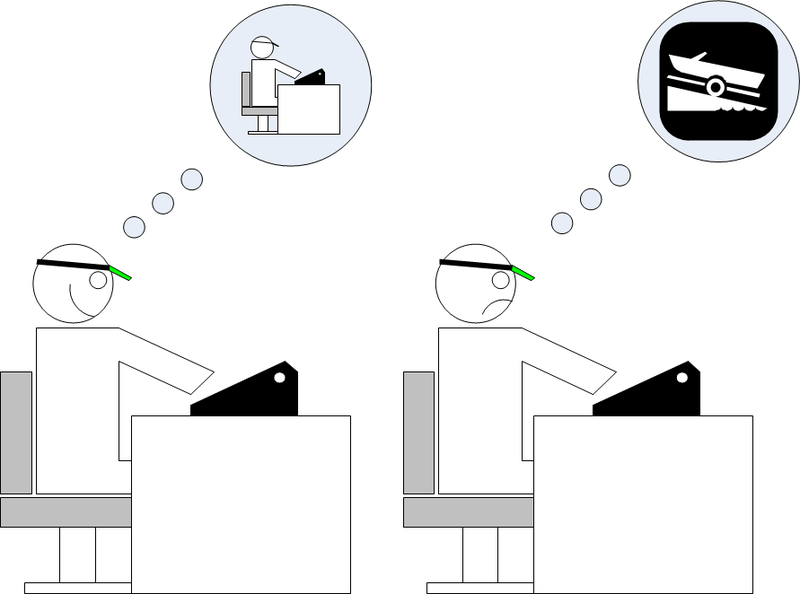 Proven solutions like PCmover® Enterprise are not always known within many IT Organizations. Microsoft’s first glimpse of Windows 10 suggests many areas which may impact IT departments in the future. A recent survey found that 80% of large enterprises and 71% of businesses plan to migrate to the new OS in the next 18 months, suggesting that it will be even more popular than Windows 7, which still commands a very large market share, particularly in enterprises. Enterprise apps can be built “once” and deployed (optimized) for all devices (although it is not that easy) – all supported via a central, unified App Store. Windows 10, Microsoft’s newest operating system, released July 29. The Action Center is a central place to view alerts and take actions that can help keep Windows running smoothly. Windows Action Center in Windows 10 will be redone and receive a face lift to fit the new metro theme. The Windows explorer has also been updated in the new operating system: now, when you are searching for a file, it is much faster and responsive than before. In Windows 10, users have the ability to create multiple desktops with one screen. It will be a helpful tool for those who work for hours with one large screen. Instead of splitting your screen into two squished windows, you can run each window side by side at a normal window ratio without it getting scaled down. It stays proportional. Universal apps will allow the consumer to be able to work and play on their Xbox, phone, PC, or tablet devices with the same software, if it is compatible. This allows easier access to popular applications. While “out and about” you can continue what you were doing earlier, without having to convert any files to another operating system. The new “Edge” browser will allow those who are on mobile or tablet devices, or those who just prefer the metro app, to have a more lite version of Internet that is faster. Edge is quicker, but doesn’t serve all of the plug-ins that Internet Explorer (11) does. There are no downsides to installing Windows 10 from a Windows 7 or 8 operating system. Windows 10 will be a product that is a clear upgrade from the other Windows OS’s, and will be worth the upgrade for the enhanced user experience. After Windows 10, users won’t pay for updates or upgrades, which means once you upgrade this one time, you will be done paying for your operating system upgrades until Microsoft changes its own outlook. “If Microsoft wants consumers to update, it really means that Microsoft is going to have to give those consumers those updates for free. There’s really no other way to do it,” said Michael Silver of Gartner at the research firm’s annual technology conference. Have you purchased Windows 10? What do you think of it? Share in the comments. Laplink’s PCmover software is the ideal solution for completing data transfers PC to PC, from a hard drive or image to a new PC, and for completing an in-place upgrade to a newer operating system. In this post, we will detail some common questions around PC data migration, and explain how using PCmover Professional as a solution is the best plan for your home or business’s PC deployment scenario. Question 1: How important is user-friendliness in a solution like this? PCmover is very user-friendly. The Pro version comes with an easy to follow setup wizard that guides users through the process of performing the migration. It allows all choices of what to transfer to the new PC (files, settings, user profiles, and even applications.) It is built in a way so that even novice users can easily walk through the process of transferring their data from an older Windows PC to a new one. Some users struggle with the PC to PC connectivity and get confused by networks, firewalls, etc. Laplink offers 24/7 Free Transfer Assistance with a trained professional technician who can help users through any questions they might have, and even remotely complete the migration. Business, government or enterprise customers have different needs in a data migration. Laplink provides a fully customizable version – PCmover Enterprise – that allows IT admins to create a light or no touch migration. It can be executed by users or untrained technicians out of the box. The customization is very straightforward and no development skills are needed. Question 2: How big will the impact of the Windows 10 upgrade be for businesses? Win 10 will become the new OS of choice replacing Windows 7. Since many business customer did not want to deploy Windows 8/8.1, they have waited with refresh projects and I believe that the adoption curve will be much higher with Win10 than experienced before. Business might not wait for 12 months this time around. We are working with many enterprise which are ready to switch once Windows 10 is released. Question 3: What are some of the stumbling blocks businesses face when dealing with PC to PC transfers, or other migration issues? Business have refresh projects very much under control except for the transfer of data, settings, and applications from the old PCs to new ones. Often users are left alone to perform that task themselves, leading to a dramatic increase in the costs (often soft costs unseen from the IT department) for customizing the new PC. These costs come in the form of end-user downtime, help desk support calls, data loss, etc. Automated scripts to move data are insufficient to do the job. In a recent study online, it was proven that many companies complained about data loss, since technicians did not know where all of the PC’s data was stored on the machine (beyond the document folder) and users often do not know themselves. Manual migrations of data, settings, and applications take many hours; full scale migrations cannot be done without a proven automated tool like PCmover Enterprise. Remote locations of personnel increases the costs of completing a PC to PC migration exponentially. We estimated the saving of using PCmover at a minimum of $300 per PC, but in remote locations it can be $1500 and more. With users having more options to install applications for their particular job, IT departments often do not know the full inventory and disks, downloads, and passwords. PCmover Enterprise is the proven and accepted tool for Enterprises, government organizations, and higher education organizations alike. They value saving time and money to refresh PCs, increasing user satisfaction and enabling large roll-out projects.